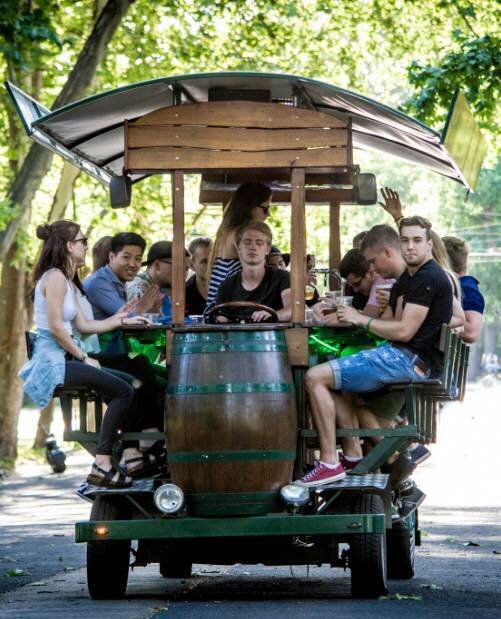 Beerbiking in Budapest is unique and unforgettable party experience for everybody. Try out our rolling beer pub where you can tap the beer for yourself while listening your favorite songs. Our party bike is the perfect solution if you wanna have fun and do something crazy in Budapest! Whether a hen party, a stag party, a birthday party or even a traditional company party it’s sure that you’re gonna be a part of a memorable experience. And the most important thing is that we’re always riding in public spaces! Pick a date, choose some drinks and hop on the beerbike with your friends! The minimum number of guests is 4, but we organize tours for bigger groups too, in that case with multiple beerbikes at the same time. All bikes have night party lights, and you can play your own music during the tour. You tap the beer for yourself, or we can provide a beautiful waitress for your ride.